Shortly after we moved in, I found it. 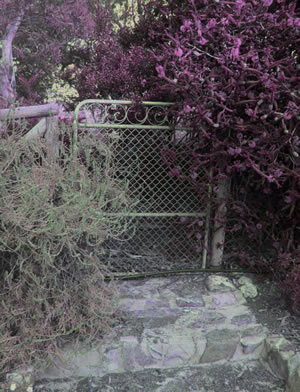 Not an existing secret garden (my holy grail) but the gate that led nowhere. The gate that didn’t open. This is it. My chance to reopen a portal to my own secret garden from the edge of my backyard to the fields beyond. The site has been chosen, shady, secluded, a place to ponder in a neglected yet beautiful area. These are, as I see it at first imagined glance, the bare essentials for a secret garden. Only my research will uncover if there are more elements. The project began with the a careful pruning of the plants surrounding the gate and an attempted opening. The gate yielded to opening after some years, but is very stiff as though trying hard to resist my will to open it. Hopefully it will settle into it’s new purpose with a bit of wishful thinking and a bit of magic spray (WD40).